Despite deep differences in their positions on the Syrian issue, Russia and Saudi Arabia have tried to maintain stable bilateral relations. We look at the present and future of the Russia-Saudi relationship with Russian analysts of Arab affairs. King Salman, the reigning monarch of Saudi Arabia, came to the throne on January 23, 2015, after the death of his brother Abdullah. Like his predecessor, Salman is an old man (80 years old) and not in the best of health. The first year of King Salman’s rule has seen an intensification of Riyadh’s foreign policy; Saudi Arabia entered the war in Yemen, broke off relations with Iran, and actively continues to support opposition Sunni groups in Syria, as it attempts to remove Bashar al-Assad from power. Moscow is firmly against this approach, believing that Assad must be part of the “political solution” to the crisis in Syria. Russian analysts believe that the son of the current monarch, Prince Muhammad bin Salman, is the prime mover behind these foreign policy initiatives taken by the King. By Saudi standards, Prince Muhammad is very young (30 years old), but great power has been concentrated in him. He was appointed as the kingdom’s Minister of Defence, and is also in charge of the Royal Court and the Council on Economic Issues. A number of analysts see Prince Muhammad as a likely successor to King Salman (breaking Saudi tradition, by which the monarch’s oldest surviving brother assumes the throne). Gregory Kosach, Professor of Russian State University for the Humanities and an analyst of Arab affairs, called Prince Mohammad “today’s strong personality” of Saudi Arabia. In a conversation with RIR Kosach said the Prince’s key role can be seen in the fact that under King Salman, the policy of the Kingdom “has started to move away from the principle of rigidity.” Kosach noted that Mohammad is paying great attention to Russia; he has met twice with President Vladimir Putin in Russia; in St. Petersburg and Sochi. 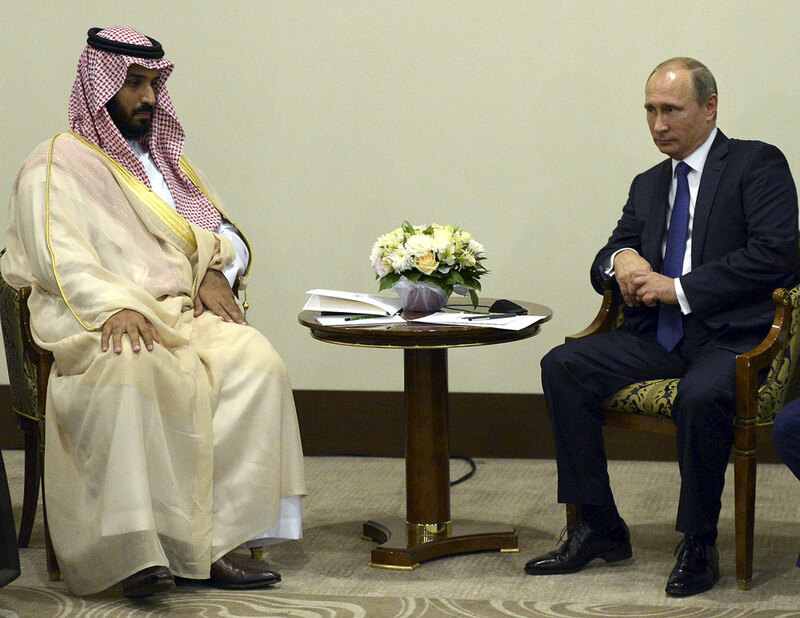 During the meeting in Sochi, Muhammad bin Salman warned Putin about the “dangerous consequences” of the Russian military operation in Syria. Earlier, the Saudi Foreign Ministry condemned the operation and called on Moscow to stop its air strikes. A few months later, the positions of both countries remain unchanged; Saudi Arabia insists on Assad’s resignation or his forcible removal, while Russia believes that the current Syrian regime must be part of the political solution to the crisis. Alexander Aksenenok, an an Arab expert at the Russian Council on International Affairs, said Riyadh’s approach to the Syrian issue is unproductive. “The overthrow of the Assad regime by force, which the Minister of Foreign Affairs of Saudi Arabia is seeking, will only lead to total chaos – similar to what happened in Iraq,” Aksenenok told RIR. Kosach believes that having opposing views on a resolution of the Syrian issue does not hinder dialogue between Moscow and Riyadh. On the contrary, it is pushing both to seek mutually acceptable options - “It was the steadfastness of Russia that pushed the Kingdom to support a cease-fire in Syria”. Kosach however considers that supporting the ceasefire does not mean that the Saudis have abandoned their plans to overthrow Assad. In addition to the Syrian crisis, Saudi Arabia is apprehensive about the partnership between Russia and Iran. Aksenenok said in the backdrop of the lifting of economic sanctions against Iran, Saudi Arabia is concerned about the future strengthening of the Shiite state, with which Riyadh is fighting for influence in the Middle East. The Saudis perceive relations between Russia and Iran as a strategic partnership and therefore, they do not trust Moscow. Analysts in Russia believe that despite their contradictions, Russia and Saudi Arabia are quite capable of working well together. “At the end of last year, Moscow hosted a joint Russian-Saudi Business Forum, and dialogue is maintained through the Russia – Gulf Cooperation Council, in which Saudi Arabia plays a key role,” said Kosach. Kosach also noted the importance of cooperation in the energy sphere, particularly on the recent agreement reached between Russia, Saudi Arabia, Qatar, and Venezuela to “freeze” the level of oil production in 2016 at the January level.